No introduction of Sen. John McCain, it seems, comes un-preambled without the obligatory benediction of his “heroic service” in Vietnam. 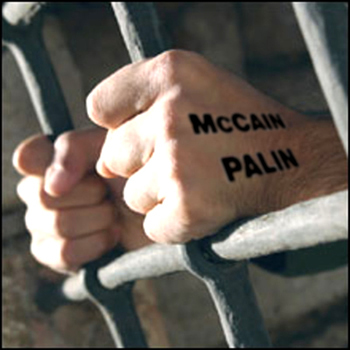 Should there be an exception we may be assured that McCain himself, who is as much a professional P.O.W. as a professional politician, will find a way, as he did in addressing us as “my fellow prisoners,” to remind us. I, for one, will have no more of it. John McCain did not, as is often remarked, bomb Hanoi to keep me from having to trade my pasta for pho noodles for the rest of my life (anymore than the current stupid war he supports is to keep my daughters from having to wear burkas). I regard these wars has his wars, wars of his preference. So screw him if he gets shot down while dropping bombs on people who never attacked us. Getting shot down is not heroism, it’s ineptitude. John McCain is lucky that the No. Vietnamese didn’t let him drown, or worse. Had I been subject to his bombing raids I would have called the kids to watch the bubbles surface on the lake he landed in. In paraphrase of Adrian Kronhauer, “Thaaaank You, Vietnaaaam.” That was even before the N. Vietnamese knew that John McCain, was the princeling of a line of Navy Admirals and might have some propaganda value. Just like Prince George of the Bush line, he came to his sense of entitlement from the same exclusiveness and hubris. Even many Obama supporters, most recently Colin Powell, will cut McCain considerable slack—despite his windsocking on policy positions, his ridiculous and cynical choice of Sarah Palin, and his tacit approval of false charges and racist attacks on Barack Obama—by implying that he might make a good president. Powell himself said that “either man would make a good president,” displaying the same stupidity that got him fragged by the neo-cons to take the fall on the non-existent Iraqi WMD. Such attitudes—again because of the faux “hero” reputation of McCain—are ignorant of the fact that McCain, a man who notoriously, even by his supporters, has a mean and quick temper, who has shown signs of emotional instability, and who will sacrifice his principles by kissing up to the extreme right wing and religious fundamentalists of the Republican Party, would likely be even more dangerous a president than his dim-witted predecessor. As a well-reasoned article in The Atlantic Monthly recently argued (“Why War is His Answer,” by Jeffrey Goldberg, October 2008), McCain still believes, as did his Admiral father, that the Vietnam war was winnable. A “victory” in Iraq and/or Afghanistan, however that might be defined, would not only vindicate his belief that these wars are “winnable,” but would also “prove” that, without the “meddling” of politicians, the Vietnam war, his war, would also have been winnable. What makes John McCain more dangerous than George Bush is that Bush only needs the appearance that his conduct of the Iraq war is in a pre-victorious state by the time he leaves office—victory for Bush is what his legacy will say. Bush needs to be able to say, as a Marine helo pilot said to me several years ago, “When I left we were winning.” McCain will need to actually (again, however one defines victory in these forms of conflict) win. He is not joking when he says “as long as it takes.” Of course, with Palin just a heartbeat away, a person who has consented to fewer press conferences than Joe the Plumber, Iraq might be turned into a moose hunt of epic proportions.